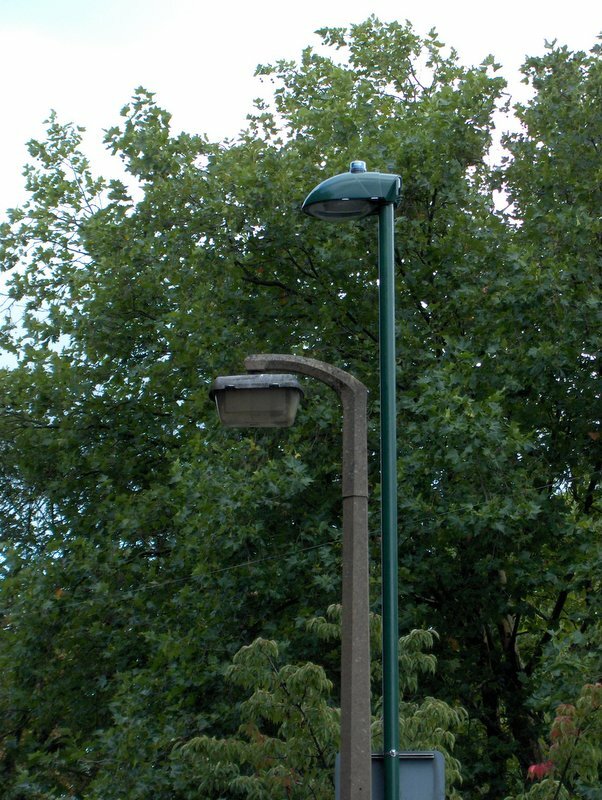 The London Borough of Sutton are currently replacing the street lamps in the Carshalton and Wallington areas. The old lamps were low power Sodium and had very poor control of the spread of the light. Knowing that modern lamps have a lot better control of the spread of light I waited for the results of replacing the lights with both anticipation that the light pollution & trespass from the Sodium lights might be reduced allowing me to make more astronomical observations from my back garden. The pictures below show some of the results of the replacement. Before we continue I should say that the London Borough of Sutton (LBS) frequently states how Green and Environmentally friendly they are however they seem to have a blind spot when it comes to light pollution & light trespass. While other councils have a section on how Light Trespass is now a Statutory Nuisance under the Environmental Protection Act. and what to do about it the LBS make no mention of it on their site. I first noticed markings appearing on the verges and pavements near the existing lights and made the assumption that the LBS were intending to replace the lights. 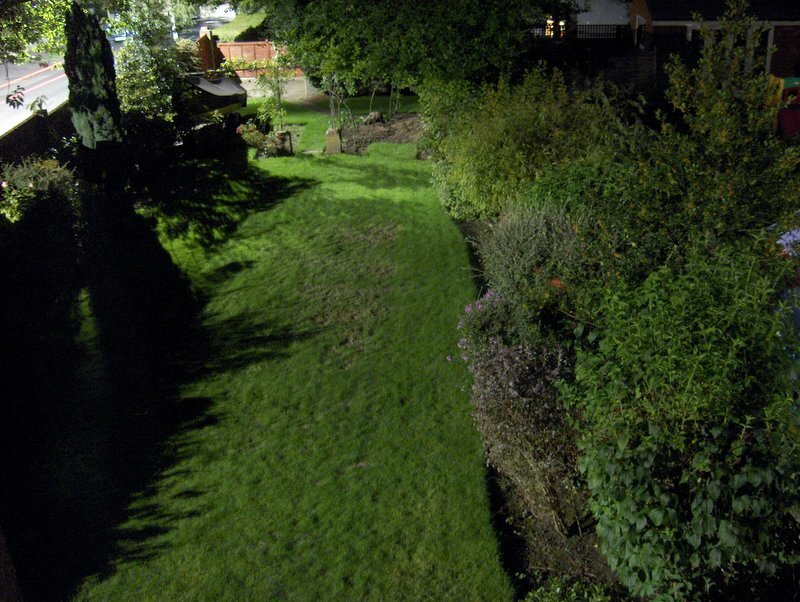 In anticipation I sent a message to the LBS via their web site asking if they were intending to replace the lights and if so what they were intending to do to prevent light trespass in my garden and to reduce the local light pollution. This was sent on the 7th July 2006 and the response promised a reply within 7 working days. To the 1st September 2006 I have had no reply despite two chasing emails being sent. The International Dark Sky Association have published a report on the effects of 'white' lighting that has significant energy emission in the Blue part of the Spectrum. The report is available on this link - there is a lot more work to be done but some of the conclusions are rather worrying. I have just discovered that The London Borough of Sutton now have a page about Light Pollution on their web site which can be found here. Yo should be able to report Light as a nuisance in the same way as Noise as Light now has the same status in the Environmental Protection Act following the amendment introduced by the Cleaner Neighbourhoods and Environment Act. However if you try to report Light Pollution in London via the 'Your London' report it page here. However there is no option to select Light Nuisance or Pollution. If you want to help send some feedback to the Your London feedback page. I am not sure if the site is maintained as the front page seems to be several months out of date - the last update appears to be around September 2009. I have actually received a reply after a year and about 10 emails as well as a couple of web forms !!!! All we need now is some action to remove the light pollution. Also some more information on the 2007 Street Light Replacement Programme and on how bright lights aid crime. Now the before & after pictures ! 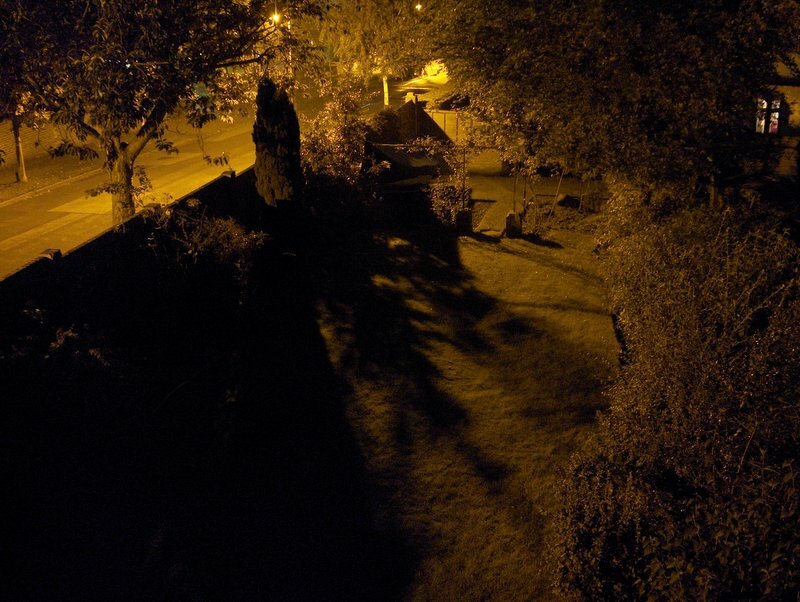 Note the reduction in the shadow area in the foreground due to the light trespass from the second street light - also the shadow lengths are reduced due to the higher light column and the shadows are sharper due to the smaller light source. While you may think the digital camera exaggerates the light trespass in fact I can read the small labels on the camera controls by the surplus light ! 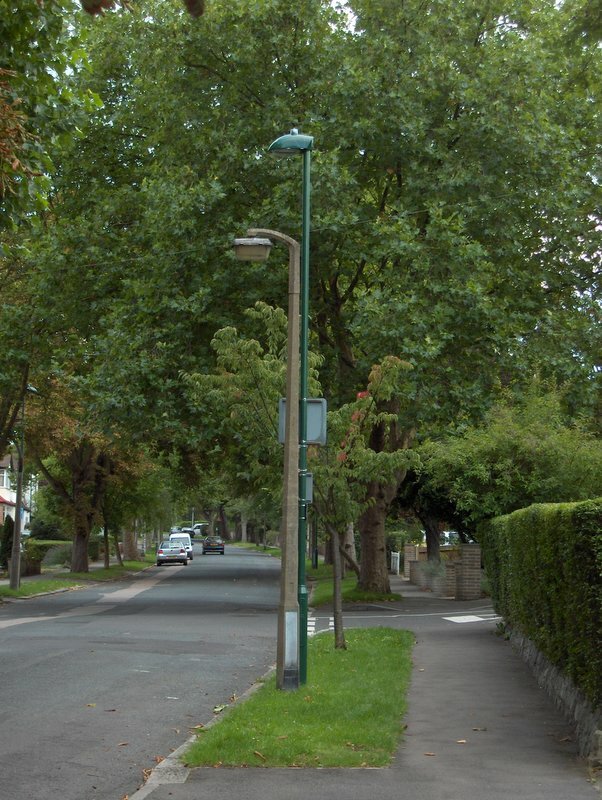 The street lights are very poorly designed and create a high degree of dazzle in much the same way as those installed in other areas of the borough. For instance those in the northern part of Boundary Road and in Woodcote Road, are typical bad examples. The surface brightness of the fittings is so high that it results in the eye reducing it's sensitivity so the lighting at road level appears to be quite low though in fact it is very high. If you are in the area you can easily test this or try the following on your local street lights if you have HPS or Metal Halide lights that are not full cut-off. When you are driving along a road illuminated by these lights try putting the sun visor down in your car so that it shields the fittings. You should notice that the road appears to be brighter and 'better' lit ! The effect is reduced if there are cars traveling towards you with their headlamps on as the high surface brightness of these causes you eye sensitivity to reduce. If you are walking a similar effect can be seen if you use a dark umbrella preferably black to shield the lamps. You also get much the same effect if you walk along looking at your feet so the lamps themselves do not appear in your field of vision - the only problem with this is that you are then more likely to step in front of a car or fail to spot the 'bad guys' hiding in the shadows ! Street Light viewed from inside the 1st floor window. Controlled light spread ? - I don't think so ! 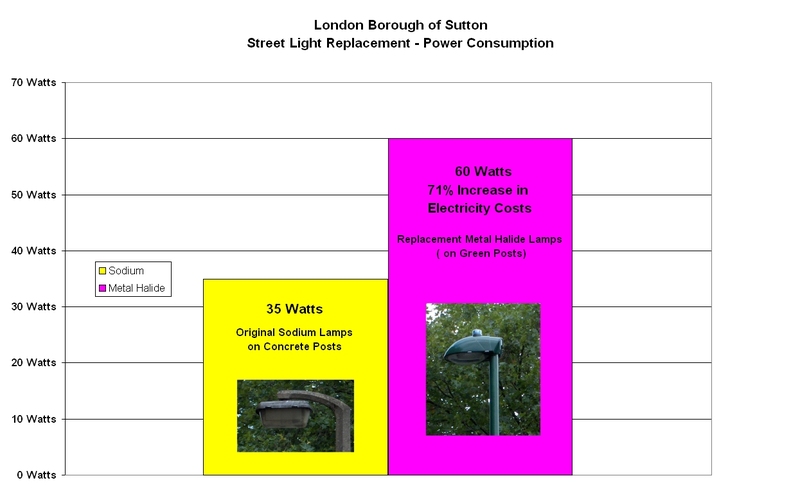 Following a 'Freedom of Information' request to The London Borough of Sutton I have been able to find some information about the replacement street lights. The new lamps are Urbis Sapphire 1 with a Philips Lighting Cosmopolis (white) lamp rated at 60 Watts. The lamps appear to be fitted with the shallow bowl diffuser shown on the Urbis web site. As a result the electricity costs for running the street lights has increased by a staggering 71 % ! No wonder the council tax keeps going up !!! The amount of CO2 emitted has gone up by 71% as well - not very good when the London Borough of Sutton tries to convince us it's 'Green'. A change of Policy ?? The image on the left shows the lights installed in July 2006 - the illustration on the right shows the lights being installed in July 2007 ( at the Junction of Crighton Road & Sussex Gardens, Carshalton) If you look carefully the bowl shape has changed from the rounded design to a flat 'full cut off' design on the right. These are appearing in other areas of the borough as well. My Increased Crime Prediction proves true ! I predicted that the increase in light pollution would increase the crime levels - unfortunately I have been proved correct. Amongst the 'night time' crimes committed in the last year were fly-tipping of rubbish, vandalism of a parked car (see image on right) & graffiti. 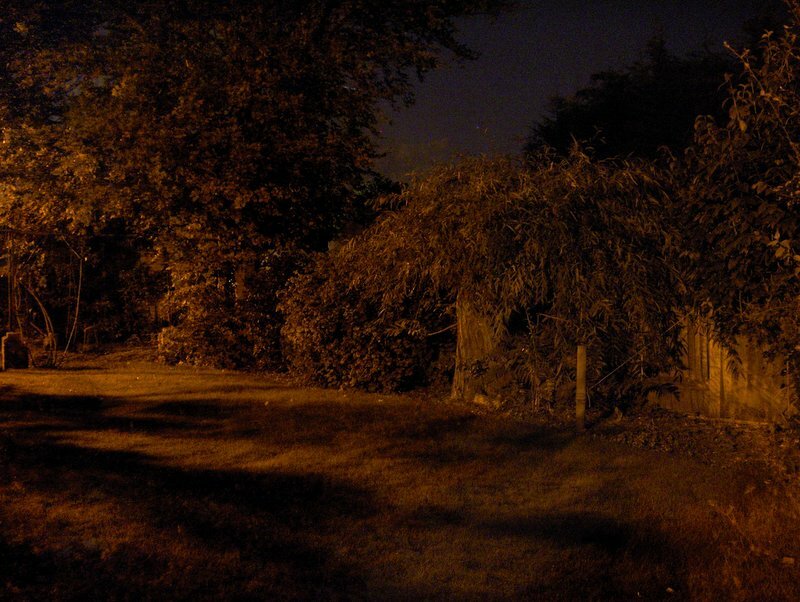 The two images above show the spectra of the old Low Pressure Sodium Lamps on the left and the replacement Metal Halide Lamps on the right. The left hand image has been enhanced slightly to show the green line as well as the Yellow Sodium D lines. Interestingly the metal halide shows some evidence of a gap in the spectra at the sodium D position - perhaps there is no Sodium in this make of Halide Lamp. The images were taken using a 'Project Star' spectroscope using afocal projection into the camera. The bottom scale shows the wavelength in nm. , the top the energy in eV. . These spectra were taken from the actual street lights involved as they have not yet replaced the LP Sodium ones at the front of the house. Low Pressure Sodium Street lights emit at a number of discrete wavelengths with most of the energy being emitted in the two Yellow sodium D lines at 489 Nm. As a result it is possible to mitigate the effects of light pollution and light trespass on astronomical imaging by using a Light Pollution Reduction Filter (LPR). This stops the transmission of the Sodium D lines and some other areas where there is relatively strong emission from Sodium lamps. Metal Halide Lamps use Sodium as well as a number of other Metal Halides in the gas in the lamp. This results in emission lines all over the visible spectrum. The colour of the light can be varied by changing the halides and the mixture within the lamp. As a result of the emission lines being spread across the spectrum Light Pollution Reduction Filters will have no effect. c: Mercury (low pressure) Gives a blue light. g: Sodium (low pressure) Monochromatic Yellow. i: Neon sign (other colors). The diagram above shows the transmission curve for one of the makes of Light Pollution Reduction Filters. The Green Lines are nebula emission lines, the red lines typical light pollution emission lines but not including the lines from Metal Halide lamps. The blue line is the filter characteristic showing how it passes the nebula lines. The grey curve is an indication of the sensitivity of the human eye. The easy way to test if your filters are capable of filtering out the light pollution from your local street lights is to look at the street lights through them. With my LPR filter one could see the Low Power Sodium Lights were on but they were very dim in comparison with the direct view. I have not yet tried this with the replacement Metal Halide Lamps but I expect they will have little effect on the lamp brightness. The only answer at present is that if you are an Astronomer don't come to live in The London Borough of Sutton. If you already live here be prepared to move ! 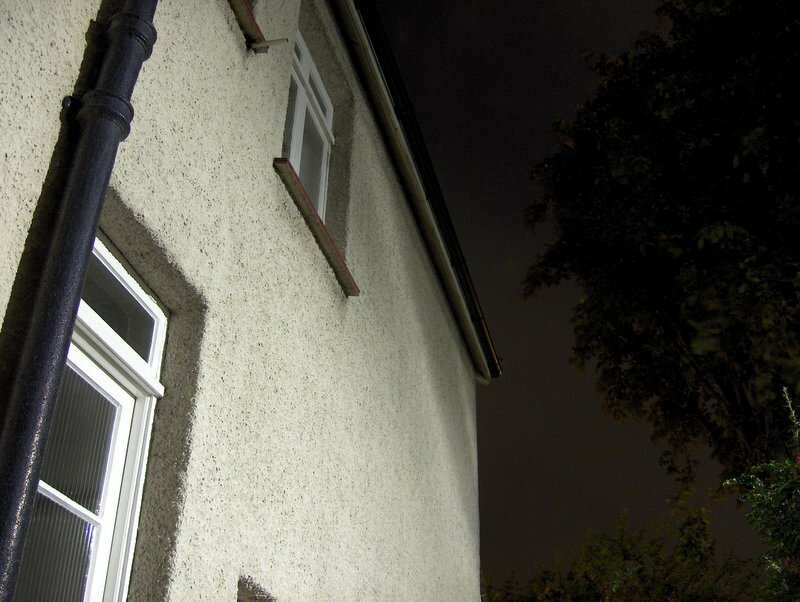 Various studies have shown that an increase in lighting results in an increase in crime so we have that to 'look forward' to as well ! I'm not sure what the local song birds make of it either - the 'dawn' chorus is now several hours before sunrise ! However there are not too many left to worry about the local cats have killed most of them. For more information on Light Pollution have a look at The Croydon Astronomical Societies page on Light Pollution which I maintain. 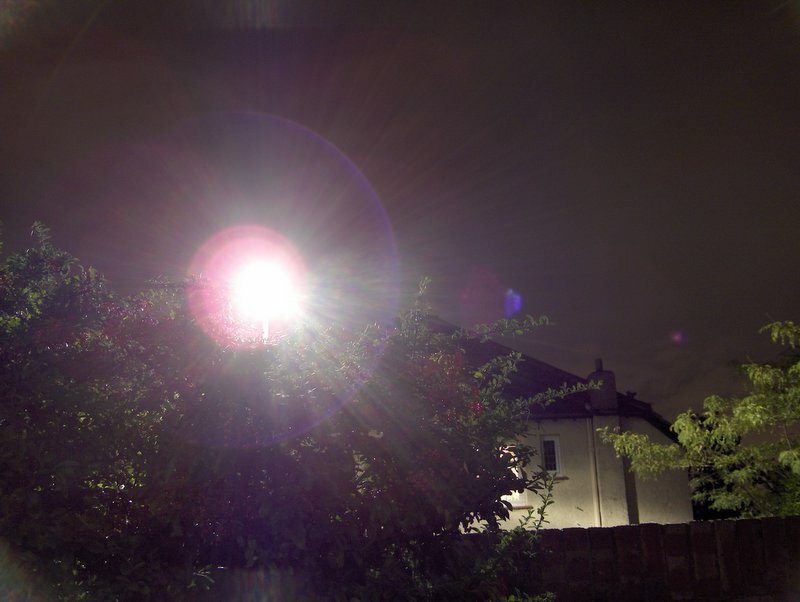 12.52 Some of the major sources of light pollution originate from domestic, industrial and commercial security lighting, floodlighting of sports facilities and the lighting of streets. The Council acknowledges that there are a number of advantages to the use of such lighting. In town centres for example, external lighting can make the townscape more interesting, create a ‘sense of place’ and identity by drawing attention to particular features and landmarks, reduce crime and the fear of crime, and can improve ambience. Also, the hours of use of existing sporting facilities can be extended to meet the needs for additional recreational demand for the benefit of residents in the Borough. 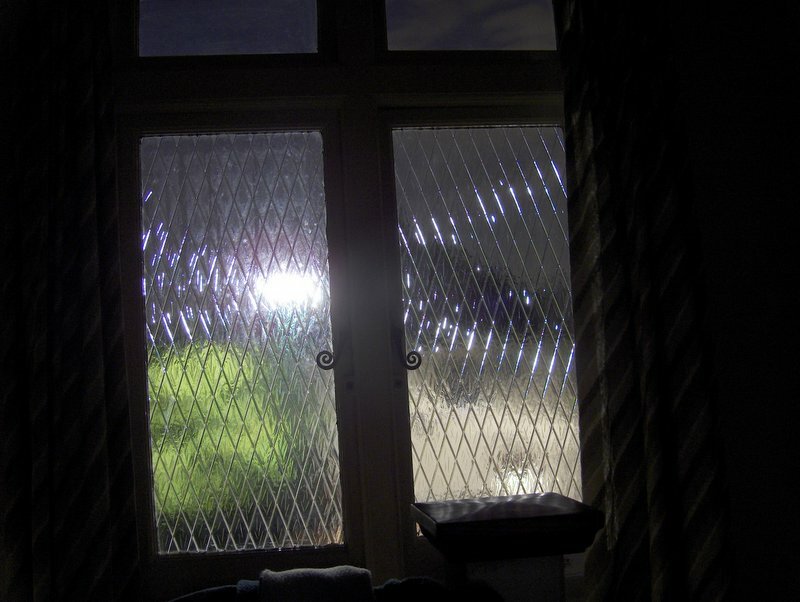 12.53 Despite these advantages, the Council is increasingly concerned about the impact of external lighting and floodlighting resulting from light pollution brought about by sky glow, light trespass, light spillage and glare, which affect the amenity of adjoining areas. 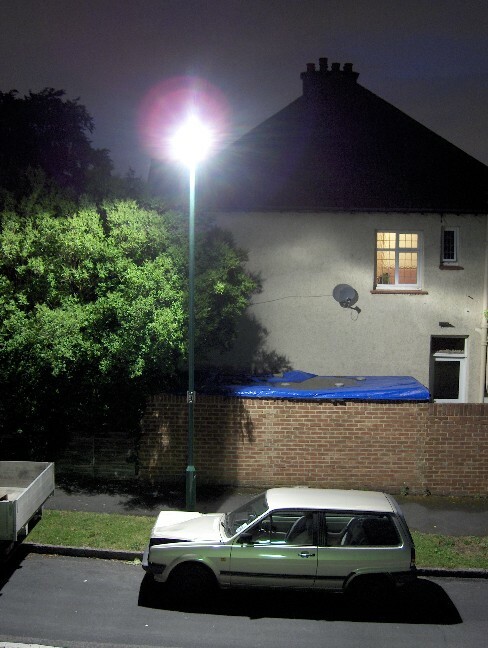 It is therefore important to prevent any adverse impacts which can result from external lighting and floodlighting proposals, including the loss of residential and visual amenity by reason of light intrusion, noise and disturbance. DEVELOPMENT PROPOSALS INVOLVING THE USE OF EXTERNAL LIGHTING AND FLOODLIGHTING WILL ONLY BE PERMITTED WHERE THERE IS NO UNDULY ADVERSE IMPACT FROM INCREASED LEVELS OF LIGHT POLLUTION ON THE ENVIRONMENT OR ON THE AMENITIES OF NEIGHBOURING OCCUPIERS. 12.55 In assessing acceptable levels of illumination for exterior lighting installations, including outdoor security lighting for domestic, commercial and industrial purposes and floodlighting for outdoor sports facilities, the Council will have regard to revised ‘Guidance Notes for the Reduction of Light Pollution’ (1994) issued by the Institution of Lighting Engineers (ILE) which sets out limits to obtrusive light for exterior lighting installations within particular environmental zones. The Council considers that three basic environmental zones are applicable within the Borough. The most sensitive areas are those of ‘low district brightness’ characterised by countryside locations such as the Green Belt. Residential environments and other urban locations outside town centres are considered to be areas of ‘medium district brightness’, which are less sensitive than countryside locations. Areas with ‘high district brightness’ levels are considered to be town centre environments, such as Sutton Town Centre, which have high night-time activity. proposed levels of illumination of lighting schemes should respect the brightness of the zone in which the proposal is located. Lighting schemes which involve higher levels of brightness than the acceptable level for the area in which they are located, will normally be opposed. The relevant ILE guidance is set out in Appendix 8, Schedule 8.2, Table 1. The Council will require applicants to demonstrate how lighting schemes meet this guidance. 12.56 Notwithstanding this approach, the Council accepts that outdoor sports facilities have specific lighting requirements, not least because of the safety of participants. The former Sports Council (now Sport England) in its Guidance Note on Floodlighting (1994) sets out the average minimum lighting requirements for outdoor sports facilities according to sport type and class. These are set out in Appendix 8, Schedule 8.2, Table 2. In considering planning applications for such development, the Council will have regard to these requirements, in particular in relation to the Class of the facility or sport proposed. Lighting proposals in excess of the requirement for the Class proposed will not be acceptable. The Council accepts that, as specified in Table 2, certain Classes of sports may have difficulty in achieving this standard. However, the Council considers that with appropriate mitigation measures, most lighting proposals for outdoor sports facilities can meet these guidelines. 12.57 In considering planning applications involving lighting proposals for facilities such as car parks and service areas, lighting installations in parks and other landscapes, the lighting of landmarks or the lighting of roads and footpaths the Council will in the first instance have regard to the British Standard on Road Lighting (BS 5489), as amended, and will require applicants to demonstrate how such lighting schemes will meet this Standard. 12.58 When assessing applications for development involving lighting and advertisements, the Council will in the first instance seek to apply Policy BE22 on Advertisements. In assessing applications for development involving lighting schemes in the Green Belt, the Council will also consider the impact of the proposals on openness and their urbanising effect. Therefore, all applications in the Green Belt should be in accordance with the provisions set out in the Green Belt Policies of this Plan. 12.59 In addition to acceptable levels of illumination the Council, in applying Policy PNR8, will also require lighting proposals to incorporate, where appropriate, mitigation measures to minimise potential adverse impacts of light pollution which may be caused by inappropriate design of lighting installations, visual intrusion, potential light spillage, sky glow and glare above and outside the development site. Impacts of floodlighting for sport and recreational facilities can, for example, be mitigated by the use of conditions restricting hours of lighting operation. 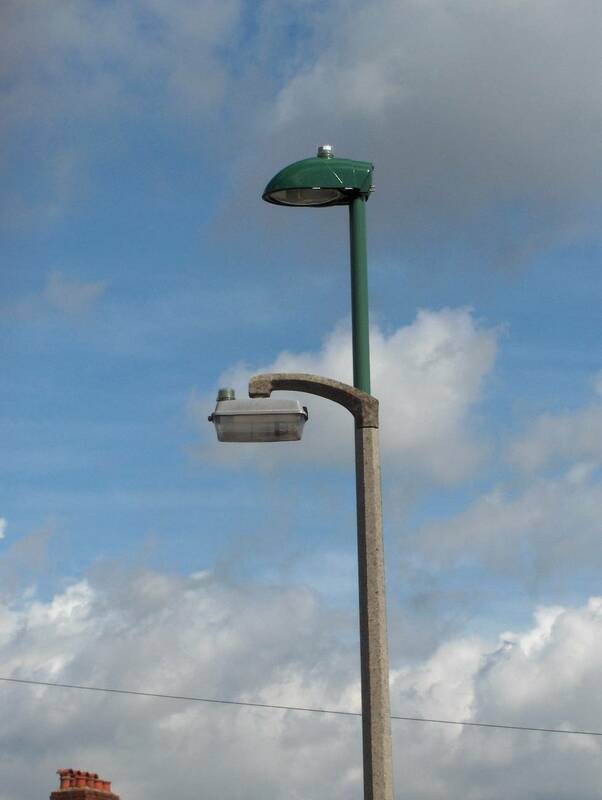 However, at all times, and regardless of use, external lighting and floodlighting should be directed such that adjoining land and properties and other areas of open land are not directly illuminated, and design of lighting should be of an appropriate scale and height and, where necessary, incorporate shields and baffles. 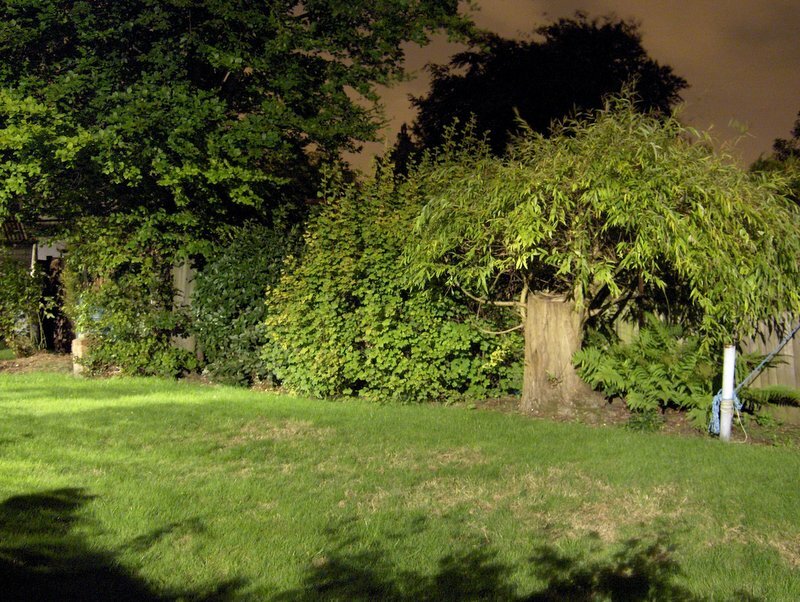 In Conservation Areas of Special Local Character and sites within or adjoining Sites of Importance for Nature Conservation (SINCs), external lighting or floodlighting proposals should incorporate greater use of mitigation measures so as not to affect the character and importance of such areas. A challenge for you is to identify how many sections of this UDP the London Borough of Sutton lighting schemes fail to comply with !